This morning I was treated to breakfast by a couple who I've known for many years. 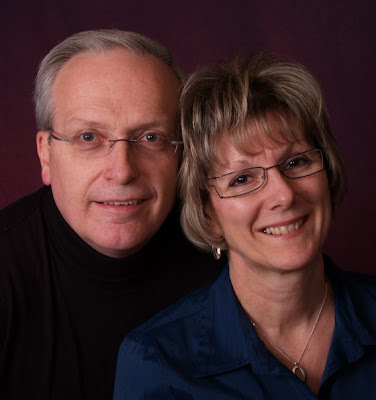 2 1/2 years ago they moved to Winnipeg, MB where Scott Bullerwell is pastoring a church. Scott had been a guest speaker in many of our Baseball Chapel services with the Toronto Blue Jays in past years and it was great to reconnect. What a blessing to enjoy conversation with friends who are kindred spirits. We share the same views on many issues but, most important, we love the Lord and enjoy serving Him. It was difficult to say "good bye" and watch them drive away. "Father, thank you for the many friends who have sent into my life over the years. You have lavished so many blessings on me - I can barely receive them all. Thank you for Scott and Brenda. Be their strength today I pray through Jesus Christ our Lord, AMEN"
So glad you were able to share a breakfast today with such good friends, David. I hope you felt as filled up having time to share their company. It helps us come from a dark place to a better light when we have time to share with wonderful people. I felt that way after an evening of laughs with new friends and a celebration for a dear little boy who needed to have people share part of his day on wednesday. Lunch the following day with a new friend and my daughter helped me feel so good inside and realize I am missing so much by not being who I want to be. and a wpg. couple too - close to us! Dear David..It sounds like you had a good day with these bosom buddies. That should give you a real good boost at losing any depression that you may have. You have to keep looking up and going forward our beloved Pilgrim! !